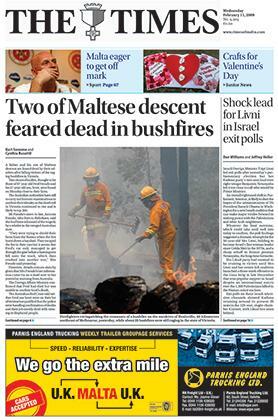 A father and his son of Maltese descent are feared dead by their relatives after falling victims of the raging bushfires in Victoria. Two charred bodies, thought to be those of 57-year-old Fred Frendo and his 27-year-old son, Scott, were found on Monday close to their farm. The Australian authorities have still to carry out forensic examinations to confirm their identity as the death toll in Victoria continued to rise and is likely to top 200. Mr Frendo’s sister-in-law, Antonia Frendo, who lives in Birkirkara, said she had been informed of the tragedy by a relative in the ravaged Australian state. “They were trying to shield their farm from the flames when the fire burnt down a hayshed. They escaped the fire in their cars but it seems that Fred’s car only managed to get through the gate before a burning tree fell on to the truck, which then crashed into another tree,” Mrs Frendo said yesterday. However, details remain sketchy given that Mrs Frendo’s last information came via an e-mail sent to her yesterday morning from Australia. The Foreign Affairs Ministry confirmed that Fred had died but was unable to confirm Scott’s death. One of the government sections responsible for cleaning up the mess normally left by vandals has called for the appointment of more wardens to guard vulnerable areas. 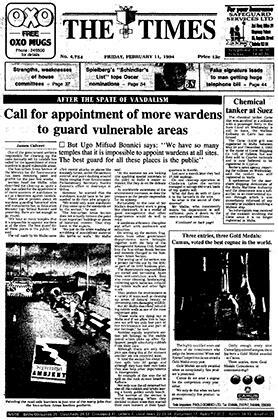 The Non-Urban Areas Section of the Ministry for the Environment has been removing paint and graffiti for the past few weeks. Section head Joe Mallia, who described the clean-up as ‘quite a job’, has called for the appointment of more wardens or watchmen to act as a deterrent against vandals. There are at present about 40 wardens guarding historical sites and monuments but as Education Minister Ugo Mifsud Bonnici said yesterday, there are not enough to go round. “We have so many temples that it is impossible to appoint wardens at all the sites. The best guard for all these places is the public,” he said. The call made by Mr Mallia came after recent attacks on places like Kennedy Grove, under the section’s control, and paint daubing around Malta ranging from Environment Parliamentary Secretary Stanley Zammit’s office to doorways in Mdina. However, he warned that the watchmen would have to be ‘persuaded’ to do their jobs properly. Fruit importers fear that the 140 tons of imported fruit they have on board the CItta di Alessandria will rot if they are not unloaded straight away. Port workers started unloading the fruit – apples, oranges and tangerines – on Saturday, but stopped when the General Workers’ Union ordered a general strike in the port. The GWU claimed it had been forced to order the strike after work normally undertaken by its members was carried out by the management of the Malta Landing and Shipping Co. Ltd. The union said the strike would continue until tomorrow, but if the need arose, it could be extended. 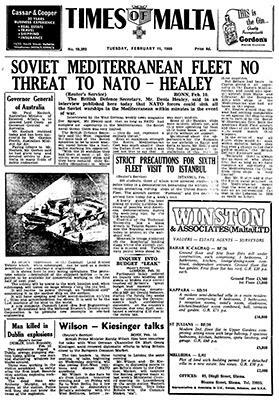 The double taxation agreement with Britain, entered into between the Maltese and British governments in December 1960, is to be re-negotiated. It is understood that this has become necessary because of the corporation tax introduced in Britain, which has affected to some degree the taxation agreement with Malta and other Commonwealth countries.